Of the approximate 13,000 companies on FDA import alert red lists, less than 3% petitioned to be removed in 2013. Registrar Corp reports on the potential reasoning behind the small percentage. Import alert petitions are often extensive and complicated, requiring hundreds of pages of supporting documents. According to U.S. Food and Drug Administration (FDA) records obtained by Registrar Corp through a Freedom of Information Act request on October 20, 2014, FDA received approximately 368 petitions to be removed from an import alert red list in 2013. 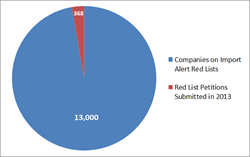 This may seem like a substantial amount, but there are approximately 13,000 companies currently on FDA import alert red lists. Along with this, only 165 companies petitioned to be added to an import alert green list in 2013. What is an Import Alert? An import alert occurs when FDA determines a pattern of non-compliance from a specific company, country, or a specific type of product. Products that fit the criteria of an import alert are subject to Detention Without Physical Examination (DWPE). Products subject to DWPE will be detained at the U.S. border without being examined by FDA. The importer or exporter of the product must then prove to FDA that the shipment is compliant in order for the product to be released into the United States. What are red and green lists? A red list contains all the companies that FDA has specifically identified as having a history of violation and are therefore subject to DWPE under a certain import alert. For example, FDA Import Alert 45-02, “Detention Without Physical Examination and Guidance of Foods Containing Illegal and/or Undeclared Colors,” currently lists approximately 1,750 unique companies with products to be detained when shipped to the United States. When an entire product type or region has a history of violation, FDA may create an import alert to cover all shipments of that product or from that region. These broad import alerts may have a green list, a list of companies that meet the criteria of an import alert, but have proven they are suitable for exclusion from DWPE. For example, FDA noticed a pattern of adulteration in basmati rice coming from India. In response, FDA created Import Alert 02-01 to cover all shipments of basmati rice from all manufacturers in India. An Indian facility can, however, petition FDA to be added to the green list of this import alert if it is able to prove that adulteration will not be a concern with its products. 1. A company must analyze its business to determine whether adequate preventive controls or corrective actions are in place to remove the appearance of violation. 2. The company will need evidence that its preventive controls or corrective actions are effective over a reasonable period of time. At minimum, FDA will require proof of five to twelve cleared, non-violative shipments of the product on import alert to the United States. 3. Lastly, the above evidence must be organized into a petition and submitted to FDA’s Division of Import Operations. So why do such a small percentage of companies on import alert petition FDA? Many companies simply don’t know that petitioning is an option. For those that do, many are intimidated by the petitioning process. Import alert petitions are often extensive and complicated, requiring hundreds of pages of supporting documents. Though it’s a daunting process, petitioning FDA is worth it for most companies. Dealing with detentions can be a huge expense for companies, both directly and indirectly, and can stress the relationship between an exporter and importer. Companies often go through the petition process even if they don’t ship to the United States because they feel that being listed on an FDA import alert may negatively affects their corporate image and brand. Registrar Corp Regulatory Specialists are highly experienced in obtaining and properly organizing the necessary documentation required for a successful import alert petition, and can assist companies on import alert through the petition process. For assistance with import alerts and detentions, contact Registrar Corp at +1-757-224-0177 or speak with a Regulatory Specialist 24 hours a day at: http://www.registrarcorp.com/LiveHelp.